This is Prophets Russ and Kitty Walden! 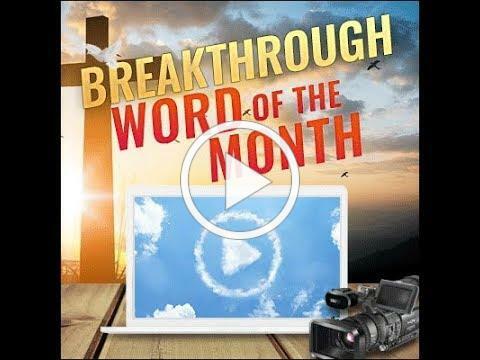 Below you will find the video for the January 2019 Breakthrough Prophetic Word over your life! (Transcription Included below video). The Father says today that January is a month of access and entitlement to you. The way into the holiest stands open to you says the Father. I have consecrated you to enter not in your own righteousness but in the entitlement of the one that sits at the right hand of the majesty on high. A throne season in your life is now underway. Detriment, downturn, and disappointment now flee away. Privilege, increase, and the satisfying of your highest heart’s desire have come. This is a time of rejoicing yes but a solemn time to reflect on the direction that your life takes now. There is now at your disposal a power word of denial against those things and even those people that have resisted and mocked your vision in times past. Let your mouth speak and let your words be stout against the opposition to My blessing in your life! The day of the scorner is over, and from this day forward I will advantage and embrace only those around you that promote My plans and My purposes for your future. What does that mean to you? It means that My patience with those toxic and poisonous relationships and situations is at an end. They will only continue if you choose not to accept the freedom that I have accorded you. The authorization from heaven is now issued to empower you to step away and turn away from the captivity of those connections into the liberty that I have extended to you like a scepter of favor in your behalf. The Father says I dare you to bankrupt the vaults of heaven that stand open to you. I have given you the keys of access to all that My kingdom affords. I am not holding out on you, and I am not holding back. Press into the turbulent and tumultuous environment that surrounds My presence, and you will break through into the open heaven that obliterates the opposition and exposes you to a level of anointing and glory beyond what you have experienced in times past. There you will find the treasuries of My indulgence and the concessions of My grace that will completely reorient what your life looks like from now on. Do you dare? Do you believe? Be it unto you according to your faith says, God. Don’t hold back and do not hesitate for many are called, but few accept the choosing. Embrace the challenge and press into this rare opportunity I have opened to you. Don’t look to the right hand or the left. Strip away every distraction that would pull you away from your commitment to the call and the invitation I have extended. Your reward will be great and that right early for as you have longed for a breakthrough, so I have longed that you taste and see all that I make available to you this day says, God. Now, God says press into this word and make it your own. Ask yourself what is your point of contact with this prophecy over your life? Every word from heaven comes to pass and manifests in your life as you engage with it by acts of faith and anticipation. I want you to go to propheticnow.com and sow into this breakthrough word over your life. Sow into the companionship you now believe God is bringing you! of the goodness of God, you will experience in the days ahead. This month we are introducing a powerful new resource to put you over in life. The Online Prophetic School is now expanded and become Breakthrough School. We have included ten new courses specifically aimed at destroying the stagnation in your life and seeing radical change become your portion. Go to www.breakthroughschool.net to learn more. Also, now is the time to seek a prophetic word over your life for 2019. Go to propheticnow.com and request a prophetic word on the website. If you want prophetic counseling and a one on one session with a validated prophetic voice you can schedule a call there also. If you need to talk to a pastor, there is a link you can use to make that happen. If you have had a dream and you know God is speaking, we do prophetic dream interpretation. We are here to be the prophets in your life. Thanks for your prayers and PROPHETIC word ,you really touch my basic desire.look forward to attract much more into my lifestyle, Life, daily. I receive and believe your words from God concerning me, thank you. My spirit leaped with joy for these truths, I look forward to the days ahead, be blessed my prophets. I am entering now into what the Spirit has planned for me before the foundations of the world. I will fulfill my destiny. I sowed into the Ministry just yesterday.